We’re having a Party for the Poudre! Poudre River organizations invite the public and friends of the river to an informal gathering hosted by and to benefit the Poudre River Trail Corridor, Poudre Learning Center, and Poudre Heritage Alliance. 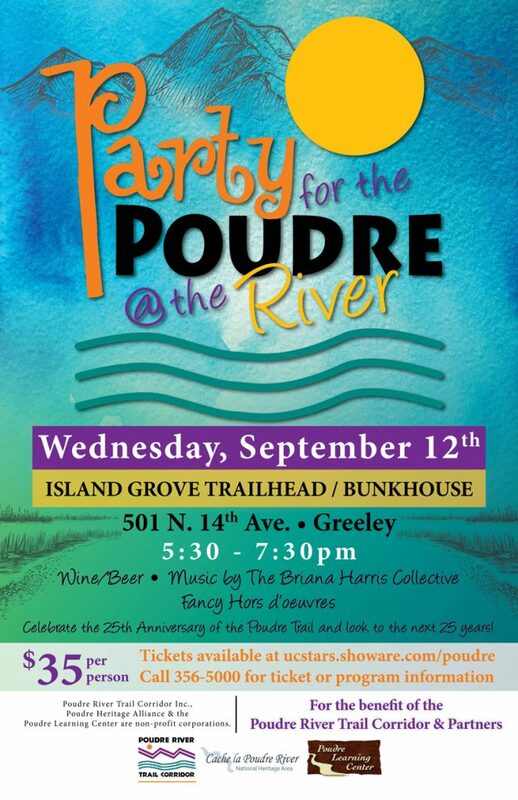 The Party for the Poudre @ the River takes place Wednesday, September 12th from 5:30 to 7:30 p.m. at the Island Grove Bunkhouse near the Poudre River trailhead. Tickets are $35 per person and may be purchased in advance online at ucstars.showare.com/poudre or at the Union Colony Civic Center box office, or at the event. For ticket or program information, call 336-4044. The Poudre River Trail Corridor, Poudre Learning Center, and Poudre Heritage Alliance are local non-profits that provide support activities related to the Poudre River. Twenty-one miles of paved pathway along the Cache la Poudre River. Hop on the trail for walking, cycling, running, rollerblading and more. The trail extends from Island Grove Regional Park in Greeley to Colorado Highway 392 in Windsor. It then connects to the paved trail in Larimer County’s River Bluff’s Open Space. Party for the Poudre @ the River is a fundraising event. All proceeds benefit the Poudre River education, trail improvements, and programs. Co-hosts and joint beneficiaries include the Poudre River Trail Corridor, Cache la Poudre River National Heritage Area, and the Poudre Learning Center.